...or why bother playing the game? It is a lesson I learned playing tennis all my life and it applies just as well to Landscape Photography. It is 10.00pm and I am pretty much done with my sunset shot of the Bay of Caldeirinhas. 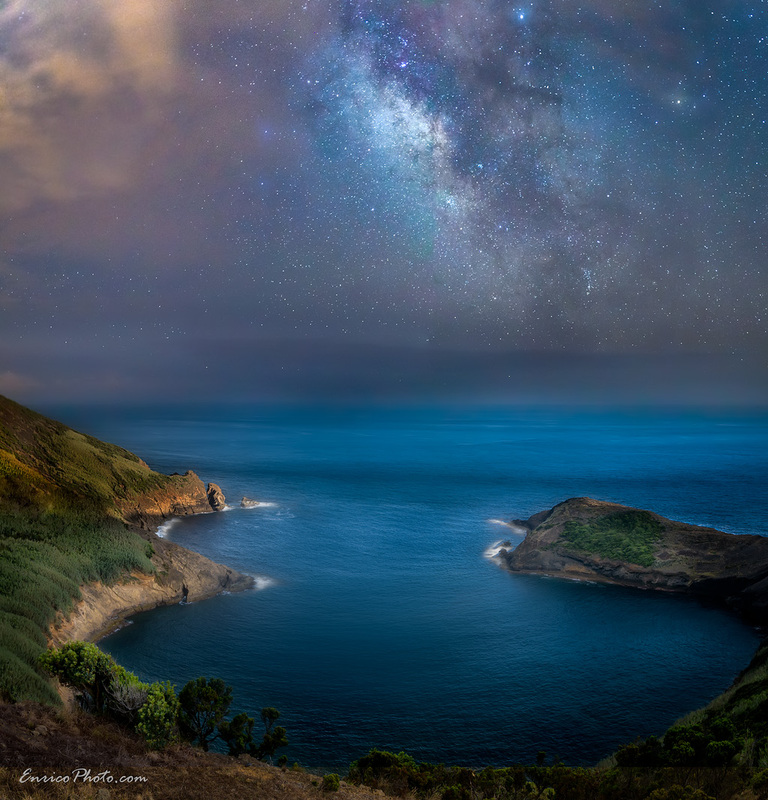 The reason why I am still here is that I want to make the most out of my 1-night stay in Faial, which means I would also like to have a go at the Milky Way here and, hoping it is not too much asking, take a sunrise image of Mount Pico from Porto Pim. One thing at a time. The Galactic Centre of the Milky Way (which is the brightest part of it) is supposed to rise above the horizon around 11pm. Well, no doubt it will rise above the horizon around 11pm, I am just not sure at all I will have a chance to photograph it. Good question. I reply that I find the bay very beautiful and I hope I will be able to blend several long exposures to produce the image I have in my mind. Also, after this I will try to take a Milky Way shot of the same scene. Sure I see, but my answer is not just a yes. There is always hope and there is always risk, but things can change very quickly when we are talking weather and light. Sometimes conditions change for the better, sometimes for the worse. It does not matter, really, since I am absolutely determined to stay here until I know the Milky Way will have moved so much to the right-hand side of the frame to kick my composition out of existence. I stay because I simply have no choice, since I never give up until the game is over. I would never forgive myself for having left too early and missed the opportunity to take the picture I wanted, especially since I do not go to Faial every week and not even every month. I have to thank my friend and great photographer Luciano Catozzi for the feedback he provided on the image, as that allowed me to produce a better final version of it. Sure enough, the morning after I woke up early to shoot Mount Pico from Faial at sunrise. Guess what? I was not as lucky as the night before and that is OK.
Mount Pico only showed its peak for a one minute, which meant about four 16s exposures. I wanted the whole mountain, but it did not happen. Until next time.. ciao ragazzi! My best shots of Mount Pico as a tribute to the mountain I have photographed the most in my life. Located in the mid-Atlantic on Pico Island, Azores, Mount Pico is a stratovolcano that last erupted in 1718. 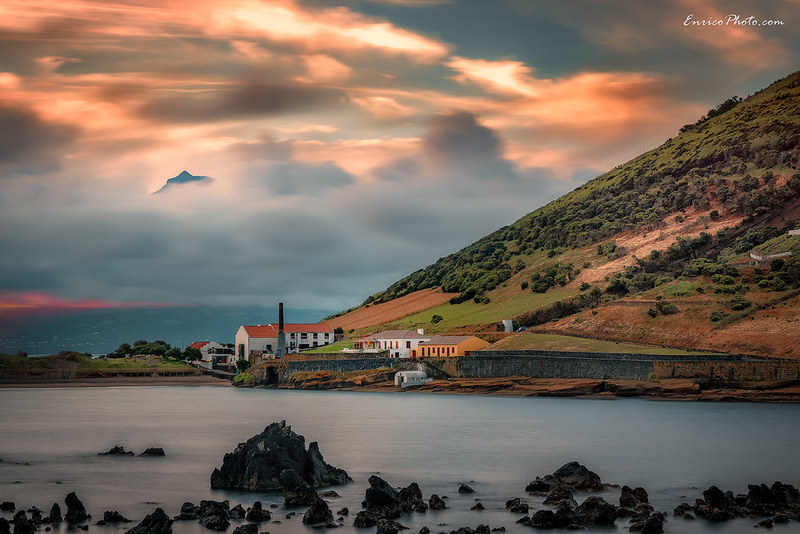 Locally called Montanha do Pico, it is best known for its fumarole and the magnificent cloud hats it sometimes wears, which are technically lenticular clouds. With its 2351 metres, Pico is also the highest peak of Portugal. I hope my pictures will do justice to its outstanding beauty.